The Edict went public during the week of April 29, 1492. 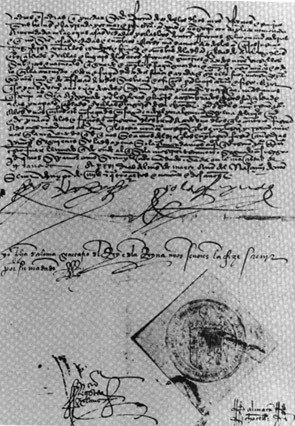 The charter declared that no Jews were permitted to remain within the Spanish kingdom, and Jew who wished to convert was welcome to stay. The power of wealthy Spanish Jewry was inconsequential. Whether a Jew was rich or or poor did not matter, they all still had to convert or leave. Ferdinand's plans for Spain, as distorted by the Christian racism prevalent in late 15th Century Spain, did not include the one group that had done so much to serve the state. (1) King Ferdinand and Queen Isabella, by the grace of God, King and Queen of Castile, Leon, Aragon, Sicily, Granada, Toledo, Valencia, Galicia, the Balearic Islands, Seville, Sardinia, Cordoba, Corsica, Murcia, Jaen, of the Algarve, Algeciras, Gibraltar, and of the Canary Islands, count and countess of Barcelona and lords of Biscay and Molina, dukes of Athens and Neopatria, counts of Rousillon and Cerdana, marquises of Oristan and of Gociano, to the prince Lord Juan, our very dear and muched love son, and to the other royal children, prelates, dukes, marquees, counts, masters of military orders, priors, grandees, knight commanders, governors of castles and fortified places of our kingdoms and lordships, and to councils, magistrates, mayors, constables, district judges, knights, official squires, and all good men of the noble and loyal city of Burgos and other cities, towns, and villages of its bishopric and of other archbishoprics, bishoprics, dioceses of our kingdom and lordships, and to the residential quarters of the Jews of the said city of Burgos and of all the aforesaid cities, towns, and villages of its bishopric and of the other cities, towns, and villages of our aforementioned kingdoms and lordships, and to all Jews and to all individual Jews of those places, and to barons and women of whatever age they may be, and to all other persons of whatever law, estate, dignity, preeminence, and condition they may be, and to all to whom the matter contained in this charter pertains or may pertain. Salutations and grace. (6) And we command all councils, justices, magistrates, knights, squires, officials, and all good men of the said city of Burgos and of the other cities, towns, and villages of our said kingdoms and lordships and all our new vassals, subjects, and natives that they preserve and comply with and cause to be preserved and complied with this our charter and all that is contained in it, and to give and to cause to be given all assistance and favor in its application under penalty of [being at] our mercy and the confiscation of all their possessions and offices by our Chamber of Finance. And because this must be brought to the notice of all, so that no one may pretend ignorance, we command that this our charter be posted in the customary plazas and places of the said city and of the principal cities, towns, and villages of its bishopric as an announcement and as a public document. And no one shall do any damage to it in any manner under penalty of being at our mercy and the deprivation of their offices and the confiscation of their possessions, which will happen to each one who might do this. Moreover, we command the [man] who shows them this our charter that he summon [those who act against the charter] to appear before us at our court wherever we may be, on the day that they are summoned during the fifteen days following the crime under the said penalty, under which we command whichever public scribe who would be called for the purpose of reading this our charter that the signed charter with its seal should be shown to you all so that we may know that our command is carried out. Source: Translation by Edward Peters based on the fullest version of the text, Documentos acerca de la expulsion de los Judios, edited by Luis Suarez-Fernandez (Valladolid: C.S.I.C., 1964), no. 177, pp. 391-395. One necessary emendation has been made, based on Fidel Fita, "Edicto de los Reyes Catolicos (31 Marzo 1492) desterrando de sus estados a todos los Judios," Boletin de la Real Academia de la Historia II (1887): 512-528. English text from: Peters, Edward. "Jewish History and Gentile Memory: The Expulsion of 1492." Jewish History 9 (1995): 9-34, at 23-28. Reprinted in: Constable, Olivia Ed. Medieval Iberia. Philadelphia; University of Pennsylvania UP, 1997. © Copyright is held by ALL original parties as listed above. Prepared for HTML by S. Alfassa Marks for the Foundation for the Advancement of Sephardic Studies and Culture in full respect to the United States Fair Use standards, embodied in section 107 of the Copyright Act. September 2002. This HTML version is copyright by the FASSAC. Notice: On the Internet are multiple versions of a document called the "Edict of Expulsion." These are abridged translated versions with no accurate source, thus, they should not be considered authentic. Above we provide the most accurate historic version of the Edict of Expulsion of the Jews.